Beach engineer Chris Gibson expected some of the newly arrived sand to be pushed back out to sea during the spring northeaster season, but said it’s all a part of the symbiotic relationship between beach nourishment work and “Mother Nature." SURF CITY, North Carolina — Last week a northeaster hit Topsail Island during a full moon, washing away some of the dunes that were built in recent weeks as part of Surf City’s ongoing $5-million sand-haul project and a separate $300,000 beach push. 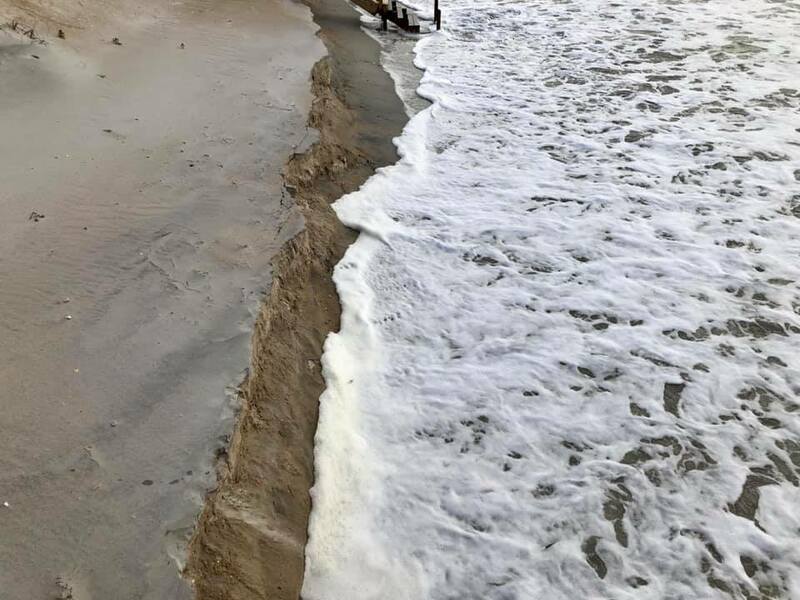 Beach engineer Chris Gibson, who has led much of the island’s beach renourishment work since Hurricane Florence, said high spring tides were exacerbated by winds coming from the northeast to cause the erosion. The recent beach push operation involved bulldozers plowing sand from low tide areas to high tide areas of the beach to build temporary dunes, which Gibson said lowered the elevation of the beach. He said the full eastern moon on March 20 added about a foot-and-a-half elevation to the tide, but such an event was extreme. Although he expects minor erosion of the dunes to continue through spring, he is eyeing the southern winds of summer to push back some of that lost sand back towards the beach. Mayor Doug Medlin, a lifelong resident of Surf City, elaborated. Medlin said that although the extreme high tide delayed the sand-haul operation, he still expects the work to be finished by May 1 –– the start of the turtle nesting season. The beach push, he said, has been completed.